A unique friendship between a man and a crocodile: nicknamed “Chito”, Gilberto Shedden, a Costa Rican fisherman and naturalist has had an unusual friend: “Pocho”, the crocodile longer than 5 meters, with a weight up to half a ton. 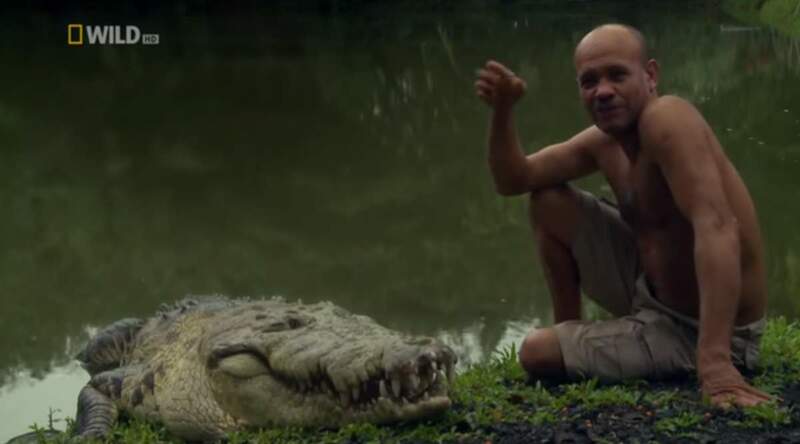 Known as the ‘Crocodile Man’, Costa Rican animal lover ‘Chito’ swims, plays and even feeds ‘Pocho’ the giant crocodile in what is one of the world’s most unlikely friendships.”The Man Who Swims with Crocodiles “Documentary follows Chito, a Costa Rican fisherman who is one of the only men ever known to tame a crocodile with people traveling from all over the country to marvel at their bond. He nursed the animal back to health after discovering him blinded by the bullet of a hunter over 20 years ago. Feeling strongly compelled to investigate these legends first hand, Roger Horrocks visits a Costa Rican shaman, “Chito” that swims with a giant croc and even rides on the back of the ancient reptile. Chito first met with the crocodile after finding him with a gunshot wound on the banks of the Central American state’s Parismina river in 1991. He had been shot in the left eye by a cattle farmer and was close to death. He was weighing only a skinny 150 pounds (69 kg). Chito and several friends loaded the animal into a boat and took him to Siquirres, where Pocho was nursed back to health. For six months, Snedden fed the crocodile chicken, fish and medicine and even slept with the crocodile during its recovery. Chito also simulated the chewing of food with his mouth to encourage the croc to eat and gave the crocodile kisses and hugs while talking to it and petting it. “Food wasn’t enough. The crocodile needed my love to regain the will to live,” noted Snedden. He hid the croc in an obscured pond under trees deep in a nearby forest until he obtained the necessary wildlife permits from Costa Rican authorities to own and raise the gravely injured crocodile legally. After an employee saw Chito swimming with Pocho one day, word of the duo’s friendship spread. In July 2000, Costa Rica’s Channel 7 filmed the unusual pair. Chito and Pocho became stars, receiving attention as far as the United States, Chile and the United Kingdom. The Environment, Energy and Telecommunications Ministry allowed Chito to keep the crocodile as long as they could monitor it. Chito worked with a veterinarian and a biologist and fed Pocho 30 kilograms of fish and chicken a week. 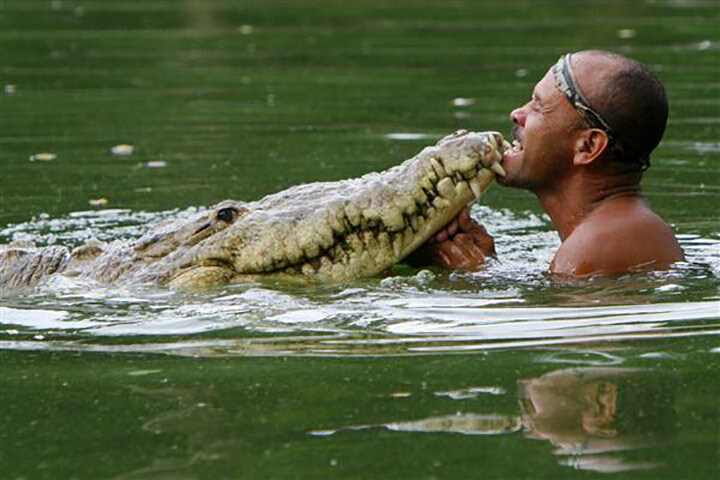 For more than a decade, Chito and Pocho performed a weekly act on Sunday afternoons in a 100 square meter artificial lake at Finca Las Tilapias in his hometown of Siquirres, Costa Rica, performing in the water for tourists from around the world, demonstrating the unique and seemingly impossible friendship between man and crocodile. The video above is a documentary named ‘The Man Who Swims With Crocodiles’ was completed by South African filmmaker Roger Horrocks shortly before Pocho’s death. Pocho the crocodile plays with his friend Gilberto “Chito” Shedden. Pocho died of natural causes on October 12, 2011 in the water outside Snedden’s home in Siquirres. 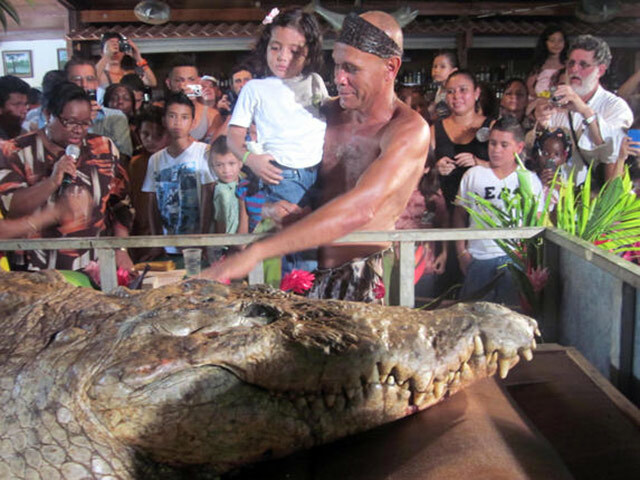 After the first ‘human’ style public funeral ever given a crocodile and attended by human friends and admirers, at which Snedden sang to his departed pet and held his ‘hand’, Pocho, a national treasure of Costa Rican culture, was stuffed. Pocho remains on permanent display behind glass in the Sequirres town museum. Snedden is currently working with a new crocodile named Pocho II, though his prospects of long term success remain uncertain, as the circumstances are not the same as his unique special relationship with the original Pocho. Gilberto “Chito” Shedden bids farewell to his friend Pocho the crocodile at an Oct. 16 funeral.